Compliance leaders utilize Governance, Risk, and Compliance (GRC) software to simplify compliance with regulatory standards such as HIPAA/HITECH, PCI, SOX and FedRamp. The traditional approach to GRC has been to manually assess compliance needs, and build processes around security risk management, enterprise & operational risk management, regulatory & corporate compliance management, audit management, business resiliency. These processes can takes many man-hours, and are typically only point in time assessments. Legacy solutions can be very similar to excel spreadsheet processes. The public cloud is being utilized in more and more regulated industries. Over 83% of healthcare organizations using some form of cloud platform. These platforms provide a wide range of cloud services as well as instant scalability and availability. With this transition to cloud, security teams have to deal with risk management and regulatory compliance across a wide range of cloud technologies, services, and vendors. GRC solutions streamline the process for managing compliance across the organization. The Dash Compliance Automation Platform streamlines regulatory compliance and HIPAA governance, risk, and compliance in the public cloud. The Dash solution enables organizations to set administrative policies which connect directly to compliance alerts in their infrastructure. Dash Continuous Compliance Monitoring proactively scans the environment for security and compliance issues. Dash makes it easy for security teams to instantly receive insight into their state of compliance. Healthcare organizations utilize Dash to streamline HIPAA compliance, manage regulatory tasks and lower their overall risk profile. include digital health companies, urgent care facilities, and healthcare providers. Dash Vendor Risk Management (VRM) simplifies 3rd party risk management through a digital vendor assessment process. Explore how Dash can simplify your organization’s compliance efforts and execute on your cloud security plan. Create administrative policies by answering plain-English questions. Policies created in Dash are tied into technical controls and further event reminders. Dash continually scans your AWS cloud environment for HIPAA regulatory issues. Scans are based HIPAA safeguards, client policies, and best security practices for each individual AWS cloud service. Receive reports and compliance issue emails and slack messages when your organization has regulatory issues. 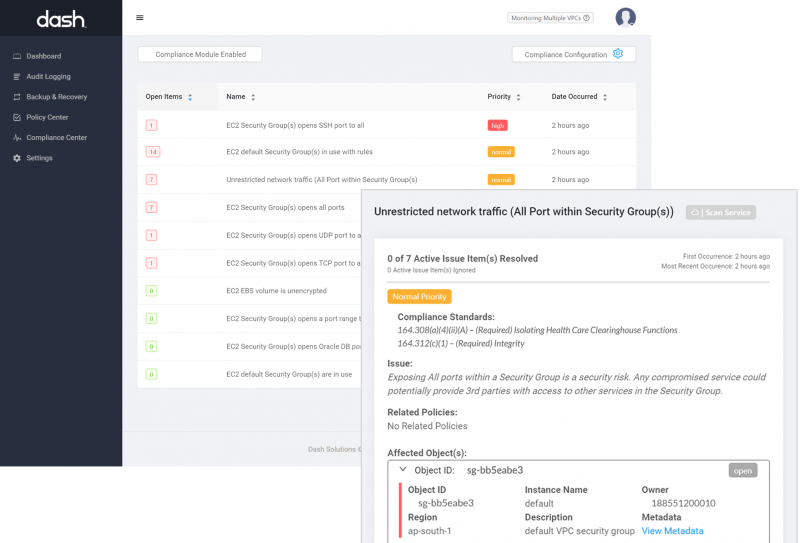 Dash provides recommendations and remediation for HIPAA compliance events so your organization can avoid falling out of compliance. Build on Amazon Web Services, the market-leading public cloud platform, without having to deal with the burden of HIPAA regulatory compliance.